Traditionally, threshold levels of cost-effectiveness have been derived from willingness-to-pay studies, indicating the consumption value of health (v-thresholds). However, it has been argued that v-thresholds need to be supplemented by so-called k-thresholds, which are based on the marginal returns to health care. 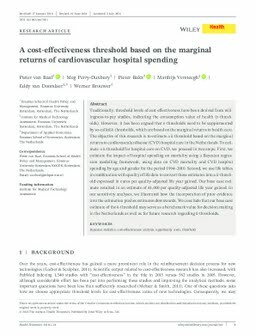 The objective of this research is to estimate a k-threshold based on the marginal returns to cardiovascular disease (CVD) hospital care in the Netherlands. To estimate a k-threshold for hospital care on CVD, we proceed in two steps: First, we estimate the impact of hospital spending on mortality using a Bayesian regression modelling framework, using data on CVD mortality and CVD hospital spending by age and gender for the period 1994–2010. Second, we use life tables in combination with quality of life data to convert these estimates into a k-threshold expressed in euros per quality-adjusted life year gained. Our base case estimate resulted in an estimate of 41,000 per quality-adjusted life year gained. In our sensitivity analyses, we illustrated how the incorporation of prior evidence into the estimation pushes estimates downwards. We conclude that our base case estimate of the k-threshold may serve as a benchmark value for decision making in the Netherlands as well as for future research regarding k-thresholds.